Eddie Krause concentrates his practice in civil litigation, business litigation and personal injury. 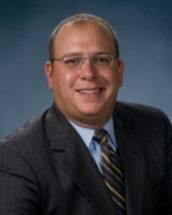 Mr. Krause graduated from Indiana University in 1998 with a Bachelor of Arts in political science and earned his Juris Doctorate from Indiana University School of Law Indianapolis in 2004. While in law school Mr. Krause was a member of the Dean's List. Mr. Krause practiced in Muncie, Indiana for a number of years before joining Cohen Garelick & Glazier. Mr. Krause is admitted to practice before the Indiana Supreme Court, the Indiana Appellate Courts, as well as the United States District Court for the Northern and Southern Districts of Indiana. Mr. Krause is a member of the American Bar Association, Indiana Bar Association, Delaware County Bar Association and the Indiana Trial Lawyers Association. Mr. Krause has served as judge pro tempore in Delaware County, Indiana Circuit Courts. In addition to his legal work, Mr. Krause has served as general counsel to the Delaware Country Club and Beyond I Can, a non-profit organization assisting the developmentally disabled.